Today, walking on a variety of surfaces along with poor shoe choices contribute to the limited movement most of us have on our feet. Weak tissues in the feet can create a clumping effect where feet, ankles and lower back become less sensitive and adjustable. But have no fear! We touch on the remedies here. So, let’s take this one step at a time – shall we? 1. Keep Your Shoulders Relaxed – The way you carry your upper body is very important. Keeping your shoulders in a relaxed position, slightly pulled back and down is a great start. Having them line up directly over your hips is ideal. While walking, keep your neck neutral for vertical support. If done correctly, this will minimize the strain on your back. You can also try practicing this while sitting at your desk to prevent shoulder pain from slouching. 2. Start By Walking Slowly – Learning how to walk properly can be difficult, so start slowly, with intention. Strike the ground first with your heel and then roll your foot forward heel to toe. Next, push off with your toes. 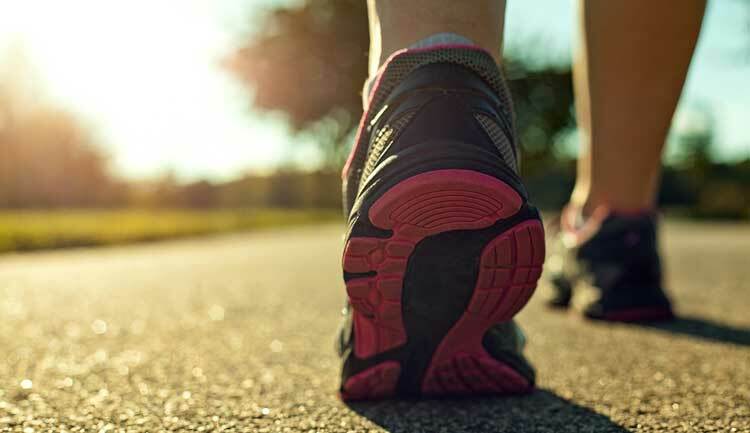 A proper walking motion uses most of the muscles in your leg, including calves, hamstrings, and quadriceps. As you walk, it is important to keep both feet facing forward at all times. Your stride should be almost silent. Which brings us to our next step. 3. Lengthen Your Stride – Allowing the leg that is behind you to linger briefly before bringing it forward will help stretch your hip flexor muscles. If your hip flexor muscles are tight, your gait will be shortened, creating an imbalance throughout your entire body. 4. Align Your Feet Correctly – Start by pointing your feet straight ahead. Be sure that you are standing straight up, grounded through the center of your heel. Proper alignment of your body extends from your feet through to the base of your skull. 5. Keep Your Weight-Centered – When your feet are set properly, your weight will be centered and your pelvis should be directly over your heels. You will find that engaging your core will be helpful. If you feel your ankles rotate inward, try lifting your inner arches by lifting the muscles of your lower leg. Remember to keep practicing these 5 steps until they become your natural posture. Stay close with good habits – they can be your best friends!